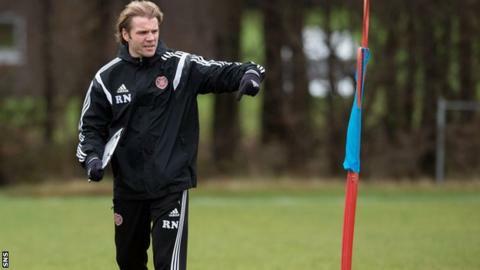 Hearts head coach Robbie Neilson hopes to add a striker to his Championship-leading squad in the transfer window. But the 34-year-old reckons the Tynecastle outfit have enough quality to win the league even if they do not add to their ranks next month. "We need to bring in a striker as we've had a few injuries in that department," said Neilson. However, when asked if he already has the players to win the title, he added: "I think we have, I hope we have." And Neilson, whose side are nine points clear of second-placed Rangers in the race for the title, added: "We haven't spoken to any agents or players at the moment. "We've put our feelers out to see what's out there. "We've been looking for the last two months and there's players out there but it's a difficult time to get players in. We don't have the money to go and buy somebody so we have to make sure it's a free agent. "You get emails in every day from agents all over the world trying to put their players in and we go through them and see what's the best one for us, then do some in-depth research." Neilson's side remain unbeaten in the league this term, having won 13 and drawn two of their matches so far. After the Hearts AGM on Wednesday, owner Ann Budge said she expects Neilson to be courted by other clubs in the future thanks to his impressive start to life in the dugout. But the head coach refuses to lose his focus. "My ambition is to win on Saturday, then hopefully win on the Tuesday, and then win the next Saturday," he added. "What will be will be in football and you can't look too far ahead - you're two or three games away from a crisis and you're two or three games away from a fantastic winning streak, so I'm not going to sit here and say 'I'm going to do this and do that'. "I want to win on Saturday and I want the boys to have a good training session today." Left back Adam Eckersley's contract ends this summer and Neilson revealed he hopes to secure the 29-year-old on a longer term deal. "He's been great and if we can keep hold of him it would be fantastic," the head coach added. "He's a good player but he's also a great character to have about. He works hard every day and he's a good influence on the rest of the players." And Eckersley said: "I'm really enjoying and it's obviously enhanced by the fact we're at the top of the league and going well. I'm enjoying my time and we'll see what the club wants to do." Meanwhile, Neilson revealed Hearts "don't have any issues" with Spanish midfielder Miguel Pallardo, after his name was included in a report about alleged match-fixing in his homeland. "It's been going on for a long time in Spain and we knew right from the start when we spoke to his agent, that he's got nothing to answer to really," he said.